Positive Pulse Radio is dedicated to highlighting positive happenings in entertainment, business and everyday life. We aim to bring you positive news. inspiring stories, and helpful information to motivate, inspire and uplift your spirit. We shine a Positive News Spotlights on people, places and things making a positive difference. Listen in for fun and uplifting infotainment and one-on-one talks with people you should know. Be informed by our life-enhancing health and lifestyle tips presented by top health professionals and lifestyle experts. From physical health to social health; From financial health to mental health and everything in between. We discuss whole health and everything that makes up a happy healthy lifestyle, including Special Segment for Kids! Join us each week as we feature spotlights on people you should know and as we share helpful life-improvement tips from top health and lifestyle experts. 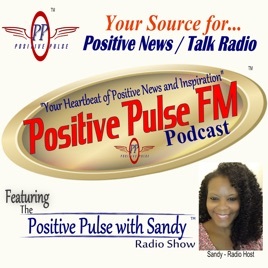 Learn encouraging ways to stay positive, happy, and healthy with Positive Pulse Radio... "Its Radio for the Way We Live Our Lives"
It’s actually positive!!!!!! Love it and love the energy.